Taiwan PM Jiang Yi-huah has resigned after his ruling pro-China party suffered stiff defeats in local elections. The Kuomintang party (KMT) appears to have lost control of districts across Taiwan, including the mayor’s office in the capital, Taipei. Jiang Yi-huah told reporters he was stepping down in order to take responsibility for the defeat. 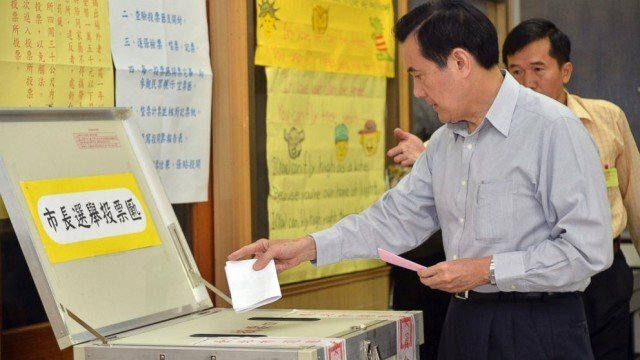 Moments later, President Ma Ying-jeou, who is also KMT chairman, apologized to supporters “for making everyone disappointed”. “I’ve received the message people have sent via these elections,” President Ma Ying-jeou told a news conference. The race in Taipei was watched with particular attention as a test of Ma Ying-jeou’s pro-China policy. In the event, an independent opposition-backed candidate, Ko Wen-je, claimed victory over the KMT’s Sean Lien. Sean Lien publicly bowed in defeat along with his solemn-faced supporters. “We congratulate Mr. Ko,” he said in his concession speech. More than 18 million eligible voters were registered to vote, choosing from among 20,000 candidates who were running for more than 11,000 positions. Some voters fear that if the KMT is allowed to continue building strong ties with China, Taiwan may become too economically dependent on the mainland and vulnerable to its pressures to reunify one day. They distrust the KMT, regardless of whether the deals signed with Beijing are good for Taiwan. KMT supporters, on the other hand, feel that Taiwan needs good relations with its biggest trade partner to breathe new life into the island’s ailing economy. They feared a victory by the opposition Democratic Progressive Party (DPP) could cause relations with China and Taiwan’s economy to regress. The DPP supports Taiwan’s formal independence from China, something Beijing strongly opposes. In 2016, Taiwan will hold the more important presidential and legislative polls.